Round Five, people! 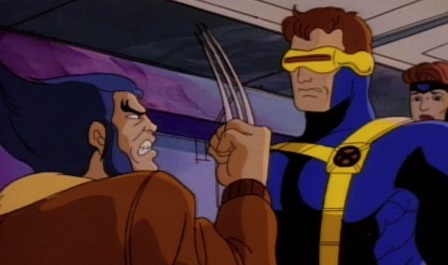 This time we go over to X-Men characters Cyclops and Wolverine. So let’s start with the obvious question: why have these two polar opposites been switched? Cyclops has, recently, been turning from stalwart leader (or ‘teacher’s pet’ in Logan’s book) to mass murderer on a scale that would make Magneto cheer and dance. Meanwhile, Wolverine has exchanged most of his berserker temper for the chance to be a principled leader of the X-Men. Until he deems it necessary to finally take someone down, that is; something he only does in private. What, exactly, did I miss? Wolverine was never this gentle except to girls (Shadowcat, Rogue, and Jubilee, for starters). In the case of the latter two youngsters, this was because he empathized with their tortured or lost emotional states; while Shadowcat needed a strong man she could relate to almost as a fighting father-figure (she already had the female equivalent with Storm). At the same time, all three girls gave Wolvie an extra purpose to keep fighting: a young innocent to protect at all costs so they wouldn’t end up like him, dead, or worse than dead. Cyclops’s job was to get the plan ready and execute it, all the while staying true to the principles of Professor X. He was the young King Arthur to Professor X’s Merlin; he listened, did what he was told, and everything got accomplished in (almost) the right way. It was no picnic, to be sure, but it was the right thing to do. To help keep him on the straight and narrow was Jean Grey, his Queen Guinevere who was loved by Wolverine but, unlike Arthur’s wife, stayed true to her love (when her mind wasn’t being manipulated or something of that sort). Now the positions have been reversed: Cyclops has exchanged Professor X’s teaching for the speeches and ‘grand’ gestures of Magneto while Wolverine has suddenly straightened up and keeps his claws sheathed until necessity demands they be bared. It seems that Jean Grey’s inexplicably permanent death (at least in the ‘present’ time of the recent comics) is the root of this change. On top of that, with the Professor’s sudden loss of direction in his teaching and without Jean to hold him straight, Cyclops is being dunked into his baser nature – and wallowing in it. Yet Jean’s ‘death’ has had the opposite effect on her clawed knight. Instead of reverting to his brutish tendencies as he has in the past when she ‘died’, Wolverine has decided to become civilized and adhere to the Professor’s original statutes; at least until such time as his animal rage needs to be unleashed to stop a villain permanently (or as permanently as it has ever been in the comics). While Jean Grey and Scott Summers have never been favorites of mine, they have been two of the strongest pillars in the X-Men comics, keeping the team on the path of right and forbidding them to go wrong. Without that support, the X-Men have begun to deteriorate. Already the team is split: half of the team is firmly entrenched behind Wolverine on the unsteady ethical high ground while the other half blindly follows Cyclops into the moral sewers. Others can’t make up their mind and spend their time bouncing between both factions while ‘trying’ to do the right thing when they’re not being stretched by opposing loyalties. It’s total chaos. The X-Men were a great story because they stood on the principles of right; not only facing evil mutants but a world that would largely be ruled by people in power who had a hatred of them for simply being born different. Despite saving the world a thousand times in a thousand different ways, there would be people who remained committed to their destruction, just as there would remain villains bent on conquering the planet. They knew that, and no matter how hard it was going to be to deal with this double hatred, they weren’t going to abandon their post. That was what made the X-Men strong. And that, fellow writers, is what has been lost through the latest events in the X-Men comics and Avengers vs. X-Men. This entry was posted in Marvel Comics' Characters and Stories and tagged Camelot, Cyclops/Scott Summers, Guinevere, Jean Grey, King Arthur, Knights of the Round Table, Lancelot, Marvel Comics' Characters and Stories, Merlin, New Mutants, Professor Charles Xavier, superheroes, the X-Men, Wolverine/James "Logan" Howlett, X-Mansion on May 16, 2013 by The Mithril Guardian.